Hummus has been around for ages. Every Middle Eastern country has their own version. I distinctly remember sharing a dish of it with an NPR reporter, washed down with Orangeboom beer at the pub in Hotel Beirut in Heliopolis, Cairo, Egypt while on my way to join my unit during the Iraq War in 1991. It had the tangy taste of lemon juice, as opposed to the cumin fragrance of the Lebanese versions I’d become used to in Northern Israel. Where the zahtar goes, whether to use paprika or chili pepper, pine nuts or plain, a pool of prepared t’chi’na in the center… these are all good questions. And, of course, the deep philosophical schism of whether to prepare the t’chi’na separately, or add the raw or toasted sesame seed paste directly to the chickpea mixture. Garlic? Usually. Cumin? Always. Olive oil advocates are split on “virgin” and “dirty” versions. In all its variations, this is a dish with immense popularity for tens of millions of people worldwide. It’s a healthy, vegan food that’s easy to make (particularly if one uses canned chickpeas), and very fast if one is armed with a food processor. It’s got great staying power: it’ll stay in the fridge for over ten days. Chickpeas are high in fiber, low in simple carbs. I’m giving you my version. It’s based on using the t’chi’na recipe I’ve already got on the blog. A note on the olive oil: while in America everyone seems impressed with clear, “virgin” olive oil (I think it’s a symptom of sexual repression), what’s needed for this recipe is the dregs and taste of the olives themselves. In Israel it’s possible to buy olive oil that’s not clear, that’s filled with the crumbs and dregs of the pressing. When I say “olive oil” I’m referring to that kind of oil, not the flavorless, insipid oil for which we seem to want to pay top dollar. I guess you could use olive juice, but that’d be a weak thing compared to the real thing. So find some local olive oil purveyor to give you what’s best for this recipe. 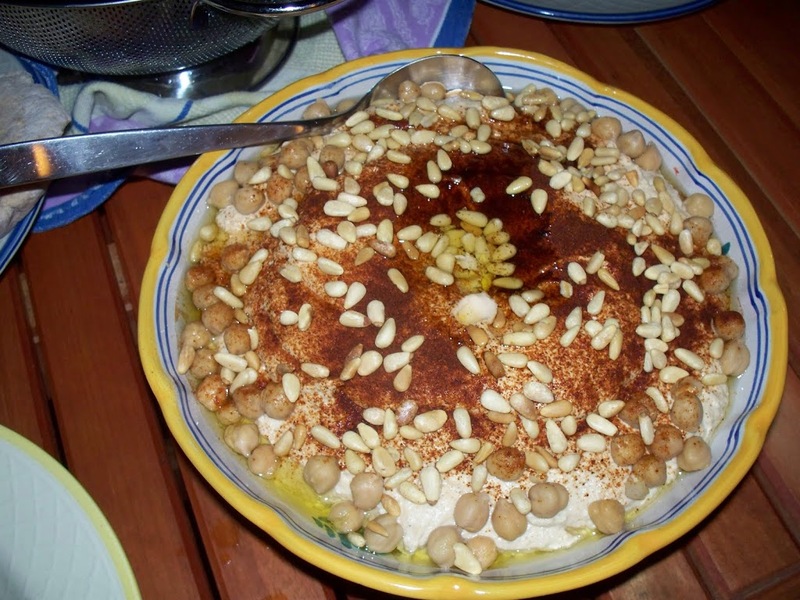 Hummus goes well with pita, tortilla chips, vegetable platters, as a french fry dip, mixed with rice, as a topping for hamburgers, or just on its own. Fiddle with the recipe to make it your own; dried chili pepper flakes, sesame seeds, poppy seeds, heck, even dried raisins or cranberries can work. Take the chickpeas and prepare them: either soak overnight with a tablespoon of baking soda, changing the water twice, or wash well, bring to a boil in 2x the water for the chickpeas, then turn off and keep the lid on for an hour. If you’re using cans, pour them into a strainer and wash well and drain. This should wash most of the salt in the liquid away. Drain the peas and let them cool to room temperature. Don’t refrigerate; take your time. Make the t’chi’na using my recipe. Reserve half the t’chi’na in a cup, keeping the other half in the food processor. Toss in 90% of the chickpeas, reserve the rest and hit high “hi” on the food processor. Add the cumin, lemon juice, and oil while things are whirring. Watch the consistency. Adding lemon juice will give it froth, adding oil will add creaminess. Too much lemon juice will make it tart (a weird thing for hummus, I’m told). Decant the hummus into a large, shallow bowl. Failing that, into a glass casserole or serving dish. Spread evenly with a spatula, leaving a depression in the center. Pour the reserved t’chi’na into the depression. Spread the reserved chickpeas around the edges of the dish. If there are extra, make it pretty in the middle. Try not to stuff any up your nose; it’s as hard as marbles to get ’em out. Refrigerate until it’s entirely cool. (I’ll eat it warm or hot, but apparently proper etiquette is to chill it. To serve, drizzle olive oil, letting it puddle around the t’chi’na. Then sprinkle liberally with paprika and zaht’r. Sprinkle the pine nuts over everything. Prep time: 10 minutes. Elapsed time: 50 minutes including cooking chickpeas.